Susanna Leonard Hill: Would You Read It Wednesday #111 - Rashad Saves The World (PB) PLUS Straight From The Editor PLUS The October Pitch Pick! Would You Read It Wednesday #111 - Rashad Saves The World (PB) PLUS Straight From The Editor PLUS The October Pitch Pick! First, if you haven't yet had a chance to read the Halloweensie Contest finalists and vote for the one you think deserves to win, please go HERE. The poll is open until 5 PM EST today. Next, we'll skip on to Straight From The Editor. You will recall that Kirsti won the September Pitch Pick with her pitch for Upside Down In Frown Town. Where Sam lives, smiling is frowned upon. But, no matter what he tries, he can't wipe the smile off his face. Even a frowning contest doesn't make a frowner out of Sam. When he can't change himself, he decides to change the town instead. This sounds cute! And I know people tend to “frown” at the use of standard popular phrases, but in this case, I think it would work like a charm. J What if, instead of saying: When he can't change himself, he decides to change the town instead, you said: When he can't change himself, he decides to turn those frowns upside down. I really like Erin's idea! It's always so interesting to hear her insights! 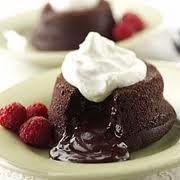 It feels like a Chocolate Lava Cake day, don't you think? And now, without getting chocolate all over your keyboards, let's tackle the October Pitch Pick! Seven year old Mekayla, who's an aspiring astronaut and lover of all things space, is convinced she sees a UFO crash land in the woods behind her house. Weird stuff begins to happen around town: lights are going on and off in an empty house, a strange girl keeps showing up out of thin air, and Mekayla finds what she believes is part of the space ship. But despite all the evidence, no one believes her! Can Mekayla and her friends save the town before it's overrun? "Clean one thing at a time." Proberta's brother suggests. "Start with your bed.” But Proberta can’t find it in the terrible mess that used to be her bedroom. She blames the Dust Bunnies, but Mom isn't buying it. Proberta hopes for magic but discovers she should be careful what she wishes for! Iris sees a sparkling rainbow. It's so beautiful, she decides she wants to be one. Her parents tell her all the reasons she cannot, but Iris is determined and won't let anyone hang a dark cloud over her idea. Soap bubbles have little rainbows on them, but when she covers herself with them, they burst and wash away. After dreaming about rainbows, Iris comes up with a way to achieve her goal. CRUNCH! To satisfy Broccolilocks' GIANT appetite her parents plant every inch of their community garden plot. But a mysterious stink leads her nose down the rows to find that something has been munching on her favorite: broccoli! Inviting hungry friends to keep pesky aphids in check, and Broccolilocks fed, may be just right! I know you may be a little burned out on voting :) but this one should be a little easier - only 4 choices instead of 12 :) Please cast your vote for the pitch you think deserves a read by editor Erin Molta by 5 PM EST on Sunday November 10. Finally, we have today's pitch which comes to us from Steve. Steve says, "I spent 20 years as a teacher of small children in London. Reading aloud was my favourite part of teaching. This means that I absolutely know what a PB, Lower MG should sound like. The challenge is to make my own writing sound right!" Steve is currently in New Zealand and wants everyone to know that if he doesn't respond to your comments right away it's because of the time difference. He is greatly appreciative of everyone's input and looks forward to hearing from you! Please send YOUR pitches for the coming weeks! For rules and where to submit, click on this link Would You Read It or on the Would You Read It tab in the bar above. There are openings in January so you've got a little time to polish up your pitches and send yours for your chance to be read by editor Erin Molta! Sure, I would read it. Couple of things: You might want to try tightening the lead in, something like: Rashad is tired of being the youngest and the least important member of his family. When he learns at school that he can save the world, he leaps into action and lands smack into trouble with the rest of his family. The last sentence was a stopping point for me. Can you re-write it to show how Rashad solves the problem himself? My vote has been cast and I enjoyed the advice Erin provided. For today's pitch, I would read it. Sounds like Rashad has a tall order he wants to fill. I would suggest clarifying what he can save the world from. Save the world from being overrun by dust bunnies? Save the world from overuse of grammatical errors? Clarifying that can help add to the interest. Up until seems to it's a great pitch. I would hint at the follow up to the trashed garden. North island or South Island. I used to live south Auckland. Good advice from Erin and a really cute pitch from Kirsti! I really enjoy Steve's pitch and story idea! One thing I'd correct is the incomplete sentence ("...he leaps straight into action. Which leads him straight into trouble with the rest of his family.") to "...he leaps straight into action, which leads him straight into trouble with the rest of his family." Donna's suggestion of how to tighten the beginning would also eliminate the incomplete sentence problem too. LIke Angela, I'd also like some clarification on how exactly he can save the world. Lastly, I'm a bit unclear about this "Rottweiler Next Door Neighbor." It makes me think that either this is a story with animal characters (anthropomorphized) or that maybe he's got a special antagonist in the dog next door. Also, random capitalization is a bit odd, so the reason for doing so must be made clearer. Best of luck with it, Steve! Mmmm. The cake looks great. I would probably read the book, but I would want to know more about how this little boy is to save the world. What did he learn in school? I wasn't clear on the Rottweiler Neighbor Next Door. What does that mean? Good luck. Pitches are so hard to write! Yep, I agree with the other comments re: saving the world. I think a couple details of HOW that would be accomplished would rev up the pitch. I always like a good underdog story! I agree with Donna. The last sentence should be focused on how he will solve the problem, not someone else. Along with some tightening at the beginning, it could really catch your attention! We had a Molten Chocolate Lava Cake for BFF's birthday 2 weeks ago. YUM . . .
Great advice from Erin...she gave an already great pitch some extra pizazz! I thought Erin's idea for my pitch was great too! Thanks for hosting the pitch contest, Susanna! I voted my for favorite pitch! Sounds like a fun story Steve. The title told me Rashad saved the world, so the last question gave me a pause. Does he or doesn't he? Is Rashad a boy or a dog, since there is mention of his Rottweiler Next Door Neighbour? Is the garden the key to him saving the world? Maybe mention the incident facing the world... I feel like the reason the world needs to be saved should be in there. Is a vegetable crisis? Is it an imbalance over family order? Rashad is tired of being the least important member of his family, so when he learns he can save the world, he leaps into action and straight into trouble. When he accidentally demolishes the neighbor's garden his career as a Super Hero seems to have come to an abrupt end. Voted. Ate Chocolate. Yay for the day. I almost forgot to vote in the Halloween contest! Heading over there now. It's a story about ecology and Rashad learning to save the planet but it becomes very super hero stuff in his mind and just keeps going all wrong. After he demolishes the neighbour's garden (he was only trying to 'borrow' a branch off her tree because he's desperate to plant his own tree) Mum realises how much money she's actually starting to save, so they go off and buy a proper tree at the Nursery and she tells him that he has saved the world..
Maybe I'm trying to be too cute with the super hero stuff in the pitch but I'm trying hard to be a little tantalising! Really appreciate all your comments. Thanks very much. I've replied above. Lots of fun stuff today, Susanna! :-) And yes, I'd read it. It sounds like a fun story! My one suggestion would be to maybe explain a little more how he plans to save the world or how he leaps into action. Perhaps mention his plan to be a super hero a little sooner in the paragraph? I hope this is helpful. Thanks for sharing! Thanks and it is helpful. But how long are these things allowed/encouraged to be? I'm kind of working on a shorter-and-sharper-the-better ethic but honestly, I find the pitch harder to write than the manuscript! So much chocolate! So much voting! Feel like I can take over the world! Such a cute story, Steve. I like the super hero aspect, and like the others, think you can clarify what you have so right and tighten it to 3-4 sentences. Rashad is tired of being the youngest and the least important member of his family. When he learns at school that he can save the world, he leaps into action--and lands smack into trouble. His super-hero antics have done X, Y, and Z (e.g. demolished his neighbor's garden). But maybe a little tree-thieving is what the world needs. I lie this, Stacy- concise and precise! Steve, the copy editor in me would add a comma after "garden' and take out the "have" before "come." I agree, Catherine, to give a little hint of what's to come. Yes, good advice to hint at the solution. Yep, the Rottweiler is gone. 8~) And the last sentence is history too. My first time here, and this has been absolutely brilliant. I really appreciate the support and advice. Voted, ate, and enjoyed the comments about today's pitch. Everyone has given some great suggestions. I just want to say I LOVE that mc's name is Rashad. That's my youngest brother's name. I just sat in on a webinar on bias and cultural diversity in books and look what I find on WYRI! I would definitely read it. I would love to see what scrapes our prospective superhero gets himself in. Yes, I am a day late, :-( but Yes I would read this because I am curious HOW he will save the world. Intriguing pitch. I also agree with what the others have said: Rashad must figure it out himself. Thanks for voting, Angela, and for your helpful comments for Steve. And I'm glad you enjoyed Erin's thoughts - I always find them interesting! Yes I would totally take this book home to my kids. The concept is perfect for them. My attempt to revise the pitch itself, hope you don't mind! Rashad is tired of being the youngest in his family, so when he learns at school that he can save the world, he leaps into action. Which leads him straight into trouble. When he accidentally demolishes his neighbour's garden, his career as a Super Hero seems to have come to an abrupt end. Will he still be able to save the world? I just deleted repetitive stuff, which maybe leaves more room for more colorful description? Good luck Steve and thanks for letting us read it! Glad you enjoyed Erin's advice and the lava cake, Teresa :) And thanks so much for your very thoughtful comments for Steve! Thanks so much for your helpful thoughts for Steve, Katie! Thank you for voting and complimenting my taste in cake, Vivian :) I'm glad you enjoyed Erin's comments, and thanks so much for your helpful thoughts for Steve! I'm sl glad you found Erin's advice helpful, Kirsti! And thanks so much for voting! Thanks so much for your helpful suggestion for Steve, Cheryl! Thanks much for your eagle eye comments for Steve Iza, very helpful! There is no such thing as Late around here, Linda :) Thanks so much for chiming in for Steve! Thanks so much for chiming in for Steve, Lauri - I know he really appreciates all the helpful feedback! I don't know if I'd state that the youngest is the least important member of the family (maybe I'm taking it personally because I'm the youngest...) but typically the youngest is favored from most of the families I've been involved with.